Google’s Nexus 7 tablet is off to such a good start that Google can’t keep up with demand for the 16GB model. The company hasn’t released any sales data yet, so it’s hard to gauge whether Google is selling out because it just grossly underestimated demand and didn’t produce anywhere close to enough devices, or whether the Nexus 7 is really selling at unprecedented levels (for an Android tablet, that is). To get a better grip on how well the Nexus is doing after just over a week on the market, the folks at ad networks Chitika provided us with some data about what they are seeing on their network. 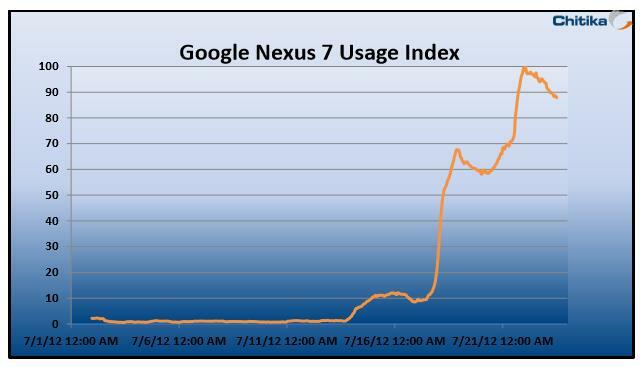 According to Chitika’s engineers, the Nexus 7 is posting “impressive usage figures” across the company’s network. 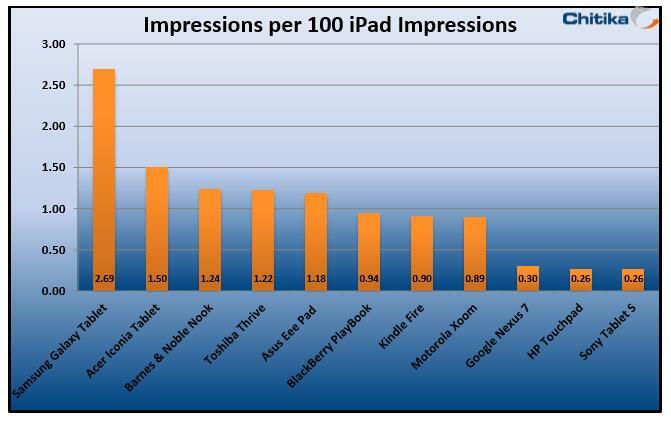 It currently accounts for 0.3 impressions for every 100 iPad impressions. That doesn’t sound like much, but the Nexus is actually on track to quickly catching up with other popular Android tablets like the Kindle Fire and Samsung Galaxy Tab. As usual, it’s important to note that there are some caveats to this data. It’s limited to the sites that run Chitika’s ads, for example, which could skew the data depending on the sites that are in the company’s network. The data is also limited to web-browsing data and some tablets are obviously more popular for web browsing that others (which could explain why the Kindle Fire is behind the Nook and Blackberry Playbook in these stats). Still, in the absence of other data for the time being, these stats at least provide us with some idea about the Nexus’ momentum. After just a week then, the Nexus 7 already passed HPs failed Touchpad and could leave Motorola’s Xoom and Amazon’s Kindle Fire behind within the next few weeks once Google catches up with demand.